Students at St. Mary’s Academy in Baldwinsville held a Thanksgiving prayer service last November. The student body collected non-perishable items to donate to St. Mary’s Parish food pantry, which helps the underserved of the community. 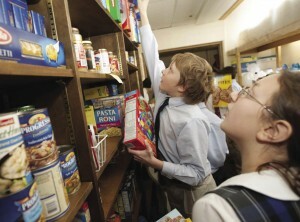 Sixth graders volunteer at the food pantry by stocking the shelves when donations are made. Last fall, two students at the Bishop’s Academy at St. Charles in Syracuse came up with a creative — and colorful — project that combined recycling and community services. Christine and Jessica Villi collected broken crayons, melted them and created “new” crayons in interested shapes and sizes. Later, the students from St. Charles donated the crayons to Vera House, a local shelter for abused woman and their children. The crayons will be distributed to children living at the shelter, who often arrive frightened and with few possessions. In honor of “The Year of the Priest,” students at Our Lady of Sorrows School – Seton Campus in Endicott prepared gift boxes filled with toiletries, small treats and handwritten notes for retired priests in the area. According to Principal Jo Anne Rowan, the retirees were so pleased to be on the receiving end of the children’s kindness and generosity. 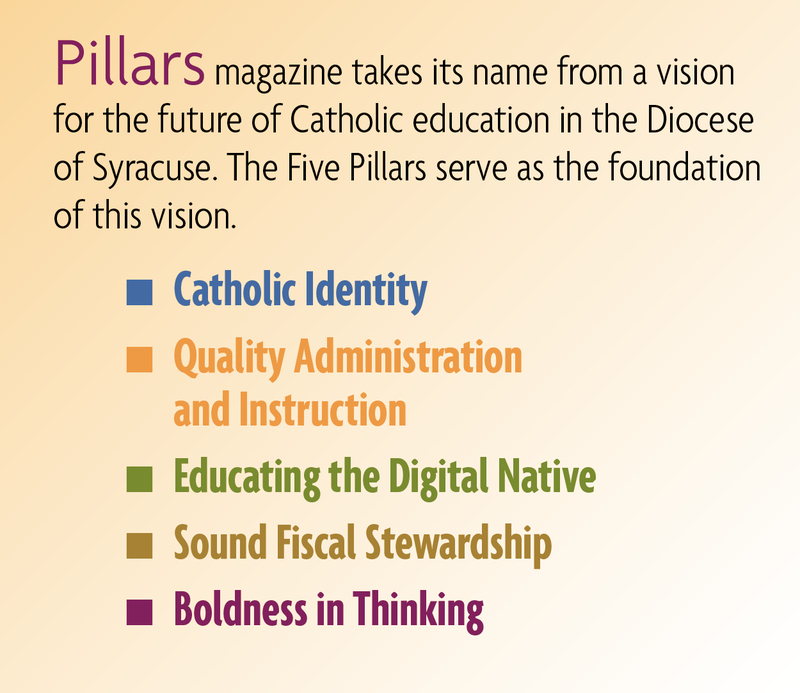 A new endeavor this school year at Holy Family School in Norwich is the G.O.D. (Giving Others Delight) project. Students adopted a military unit of one of the parents stationed in Afghanistan and have since been collecting basic items like razors, soap, toothpaste, phone cards and more. During the first half of the year, the Holy Family students sent 10 large boxes to the troops. “This compassion for others complements the knowledge and skills learned in academic classes at Holy Family,” said Principal Eugene Chilion. to their neighbors and extended families. Student Senate members designate a fall and spring weekend, where they purposely look for jobs like raking leaves and other helpful activities to assist their neighbors, grandparents or others who can use a hand. When 100 or more service hours are reached, Principal George Clancy thanks students by issuing a “dress down pass,” a special reward that all St. James students look forward to earning.